Despite higher per capita healthcare spending, US health outcomes compare poorly with other developed nations. One potential reason is that the US healthcare system creates incentives that promote the faster adoption of medical technologies with minimal benefits. This column tests this claim using data on the quality and diffusion of new pharmaceuticals in the US and four other countries. 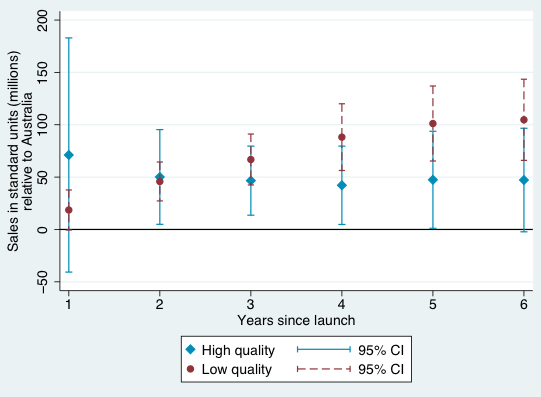 The results suggest that compared to Australia, Canada, Switzerland, and the UK, low-quality drugs diffuse more quickly in the US relative to high-quality drugs. Although the US spends more on healthcare per capita than any other developed country, it does not enjoy better health outcomes. Are institutional features of the US healthcare system driving this apparent inefficiency? Garber and Skinner (2008) hypothesised that the fee-for-service system of reimbursement prevalent in the US may create incentives for faster adoption of new medical technologies that may have minimal clinical benefits. However, directly testing this hypothesis is generally complicated in part because it is difficult to construct consistent measures of healthcare utilisation across countries in a way that holds quality of care constant. For example, a surgical procedure may be used more in one country than another because the quality of the procedure is higher in that country, not because it is inefficiently administered. In a recent paper, we argue that the adoption and diffusion of new pharmaceuticals across countries is well-suited for testing the Garber-Skinner conjecture (Kyle and Williams, 2017). First, we can be confident that pharmaceutical use is relatively consistently measured across countries – there is little difference between the cancer drug Avastin sold in the US and the cancer drug Avastin sold in other countries. Second, for pharmaceuticals it is possible to exploit an existing measure of drug quality that is based solely on clinical value (that is, this quality measure is independent of the drug’s price). 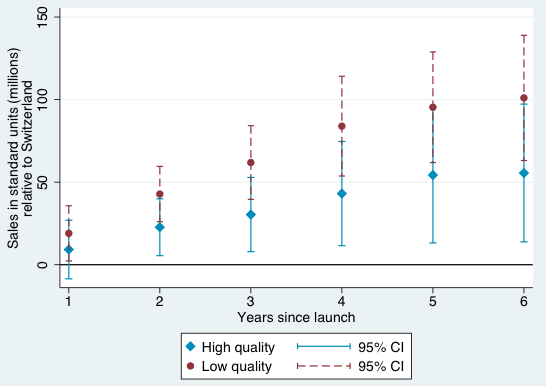 Despite having some limitations, this quality measure allows us to compare whether the US differs from other developed countries in the adoption and diffusion of drugs with relatively high therapeutic value relative to those that provide more marginal gains. We analyse quarterly data from 2000-2013 on revenues and quantities sold for new pharmaceuticals in Australia, Canada, Switzerland, and the UK provided by QuintilesIMS Health. We aggregate across all packages or presentations of a drug to the molecule (or molecule combination) level. Our key research question is: how do higher- and lower-quality drugs diffuse over time in the US relative to our comparison countries? We measure diffusion by sales of standard units (that is, by measuring quantities rather than revenues), and focus our quality metric on a comparison of more (ASMR I/II/III) and less (ASMR IV/V) therapeutically valuable drugs. We analyse diffusion over the first six years after a product is launched, during which time a new product should generally not face any generic competition. 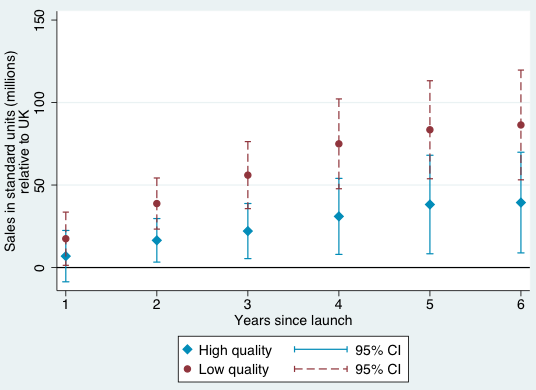 We estimate a regression specification that pools all five countries and includes fixed effects for drugs, countries, and years since launch. Our results suggest that – consistent with the Garber-Skinner conjecture – the US is indeed “uniquely inefficient” in the sense that low-quality drugs diffuse more quickly compared to high-quality drugs, relative to the comparison countries we analyse. The same pattern holds if we compare the US against each of our comparison countries individually, although the difference in coefficients is only statistically significant in pairwise comparisons when comparing the US to the UK and to Switzerland. All of these results are strengthened if we omit the ASMR III (‘intermediate’) quality category. Figures 1-4 provide a graphical summary of our results. In each, we plot the diffusion curves – units sold relative to the initial year of launch in each country – for lower-quality drugs (in dark red) and higher-quality drugs (in light blue), with 95% confidence intervals. 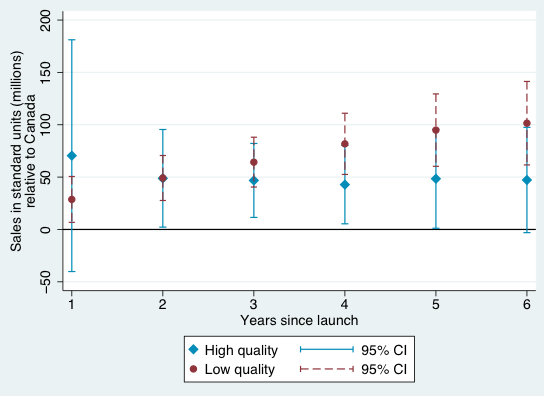 While the confidence intervals for low and high quality drugs are overlapping in this more disaggregated comparison, qualitatively the overall patterns are remarkably consistent – with the exception of the year of and first year after launch in Australia and Canada, lower-quality drugs consistently diffuse more in the US relative to higher-quality drugs, judged relative to any of the four comparison countries. Prior work (Kyle 2007, Kyle and Qian 2014, and Cockburn et al. 2016) has attempted to quantify the influence of factors such as intellectual property rights and price control policies on firms' decisions to launch new drugs globally. To the best of our knowledge, our paper is the first to focus on how diffusion varies across countries based on a measure of therapeutic quality. While our drug quality measure is of course imperfect – in particular, while it is independent of price, assignment of these measures happens in the shadow of price negotiations – it arguably takes a step forward in understanding the welfare implications of cross-country differences in drug diffusion. Our tabulations suggest that low-quality drugs diffuse more quickly compared to high quality drugs in the US relative to these four comparison countries. These patterns are consistent with the assertion in Gruber and Skinner (2008) that the US healthcare system may be “uniquely inefficient” in the sense of fuelling the rapid adoption and diffusion of medical technologies with small or unknown benefits. Our hope is that, in the future, the newly linked data developed in our paper can be combined with an analysis of policy changes in order to analyse the potential roles of specific factors in explaining the higher diffusion of lower quality drugs in the US relative to other countries. For example, does the use of centralised health technology assessments in countries outside the US encourage the adoption of technologies with higher measured benefits? What are the longer-term consequences of such policies, not only for health spending but also for health outcomes? Cockburn, I, J Lanjouw and M Schankerman (2016), “Global diffusion of new drugs: The role of patent policy, price controls and institutions", American Economic Review 106(1): 136-164. Garber, A and J Skinner (2008), “Is American health care uniquely inefficient? ", Journal of Economic Perspectives 22(4): 27-50. Kyle, M (2007), “Pharmaceutical price controls and entry strategies”, Review of Economics and Statistics 89(1): 88-99. Kyle, M and Y Qian (2014), “Intellectual property rights and access to innovation: Evidence from TRIPS", NBER, Working paper 20779. Kyle, M and H Williams (2017), “Is American health care uniquely inefficient? Evidence from prescription drugs”, American Economic Review Papers & Proceedings 107(5): 486-490. We compared the ASMR to an alternative quality measure, priority review status at the US Food and Drug Administration, and found a positive correlation. We prefer the ASMR because it provides somewhat finer information than the binary FDA review status. All drugs in our sample must have been introduced in France, in order for them to have an ASMR score. Because the European Medicines Agency (the equivalent of the FDA) grants marketing authorisations which are valid throughout the EU, France and the UK have more similar drug launches than other pairs of our comparison countries. However, regulators in all these countries have largely harmonised clinical requirements and manufacturing standards.